(RNN) – Could the next great Apple innovation be the iWindshield? The World Intellectual Property Organization, a patent agency for the United Nations, published an application last week that was submitted by Apple in 2016 for an “augmented reality display system” for vehicles. The system would essentially be an interface layered over a windshield, displaying things such as speed or a route. The patent filing also describes the system being able to identify or interact with “environmental objects” such as a sign or other cars. 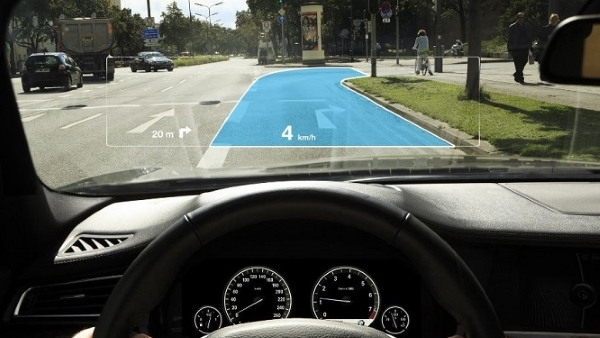 Such a windshield interface is typically called a “heads up display.” Some rudimentary versions that project information onto a windshield have already been produced. Apple’s patent, however, describes a fully integrated “smart” windshield, which could even “enable video communication with a remotely-located user.” FaceTime on your windshield, in plain speak. The patent was first reported on by the website Patently Apple. Drawings included with the patent filing also indicate the system would be able to modify external objects, such as a sign. As an example, one of the drawings shows a road sign indicating a school is two miles away and a hospital is one mile away. If a driver were en route to the school, the system would be able to obscure the portion of the sign indicating the hospital. “Based on a determination that (the school) is associated with the present driving route along which the vehicle is being navigated … the augmented reality display system … can generate a display element … so that the element obscures the unrelated content (the hospital) so that the perceived content on the sign is restricted to the relevant content (the school),” the filing reads. Another drawing shows how a route would be laid out in front of a driver, with dots indicating the directions, while other drawings show how your speed relative to the speed limit could be displayed. The patent indicates design features that would provide information on what’s in blind spots or what other cars around yours are doing, and even simulate environmental objects, such as a digital “speed bump” if you’re going too fast. A March report by WIPO indicated some skepticism about the patent application, related to its novelty and inventiveness. Apple would not necessarily need the patent to produce such a system, however. The tech giant recently valued as the world’s first $1 trillion company has also reportedly been working on self-driving car technology. It seems that Apple is also concerned about passengers who might be worried about sitting in a vehicle that can drive itself — because, yes, trust in autonomous vehicles is down. If the system detects high stress levels from your eye motion, posture, gestures, body temperature, breathing rate, eye blinking, or heart rate it can change the AR display to calm you down. Another self-driving car system, Drive.ai, similarly shows 3D driving and environment data on an on-board display. “Displaying a simple visualization helps passengers feel more comfortable,” a blog post from last month explains. What exactly Apple’s AR displays would look like isn’t clear, but hopefully something soothing and distracting. Anything to forget you’re in a car that’s driving itself. Think of conventional automotive head-up displays, but seamlessly integrated across the entire windshield and appearing embedded in the environment itself. That’s the key here—augmenting your reality with useful information in a way that’s far more organic and interactive than a simple head-up display. Furthermore, it opens up the potential for driving applications with an infinite range of possibilities. You could project braking points and gear suggestions to help you hone your technique at track days, or guide you through twisties on a motorcycle by projecting lean angles and riding line onto a visor display, as BMW demonstrated in a concept it revealed last year. Such innovations will enhance human driving. Autonomy, on the other hand, tries to take it away. But it gets even better. Once all the safety and performance benefits are combined with AR technology, the driving experience will become truly next-level. Imagine your AR system flagging friends you’re meeting with as they drive past you on the road, or pointing out gorgeous overlooks you can hike to from the side of the road, or showing where and when the Moon will rise or the Sun will set so you can impress your kids with your astronomical savvy. Once the technology meets the essential functionalities we all expect from it, it will then deliver the ones we didn’t know we wanted.